THomestary has been focusing on decorative lights from the very beginning to today, even the first battery powered string lights on Amazon was sold by Homestarry in 2013. Homestarry devote to offering superior products, adding cozy ambiance to your home and making your life colorful and memorable. To prevent overheated after long-term use, battery case is made of quality PVC and designed with smart temperature control. IP44 waterproof for all parts (to make the lights durable, please avoid the battery pack from soaking). 8 modes: combination, in wave, sequential, solo glo, chasing/flash, slow fade, twinkle/flash, steady on; 10 brightness levels can be chosen; up to 16.4 ft remote range allows you to customize illumination easily. Life span of battery inside IR Remote(included) is 3-6 months. Lights will keep 6 hours on 18 hours off automatically once activated, either Timer Button or Off Button can cease timer mode. Please do not apply excessive force or repetitively bend the same spot. RELIABLE BRAND: Since 2013, Homestarry has developed into one of the most popular brands in decorative lights category. Guaranteed by CE certification, and you will get 12-month warranty and 24/7 customer support. 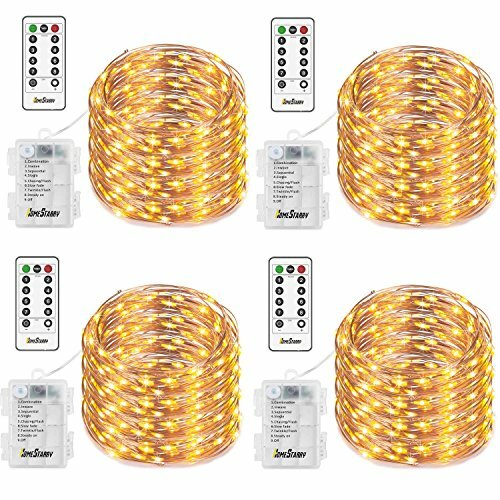 IMPRESSIVE LIGHTS: Dimmable lights for indoors or outdoors, wedding Valentine Decorative, Christmas, Thanksgiving Day, Halloween parties. IP44 WATERPROOF: IP44 Waterproof works for all parts and in all weather conditions. Avoid placing the battery case under water to make it more durable. HANDY REMOTE: 8 modes and 10 brightness levels to create ideal ambiance; lights will keep 6 hours on 18 hours off automatically once TIMER activated.